It’s a woman’s prerogative to change her mind. Right?? 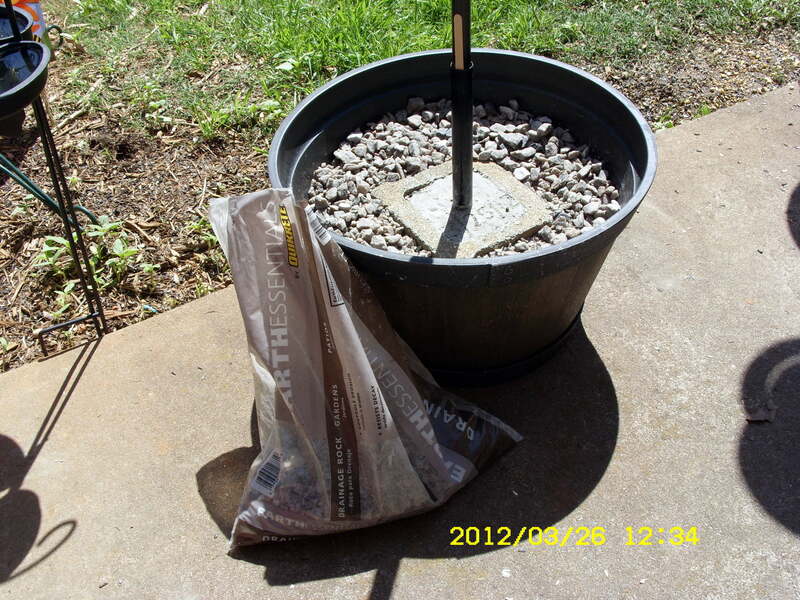 I rationalized that I needed to “build a better mousetrap” (build a better planter support). 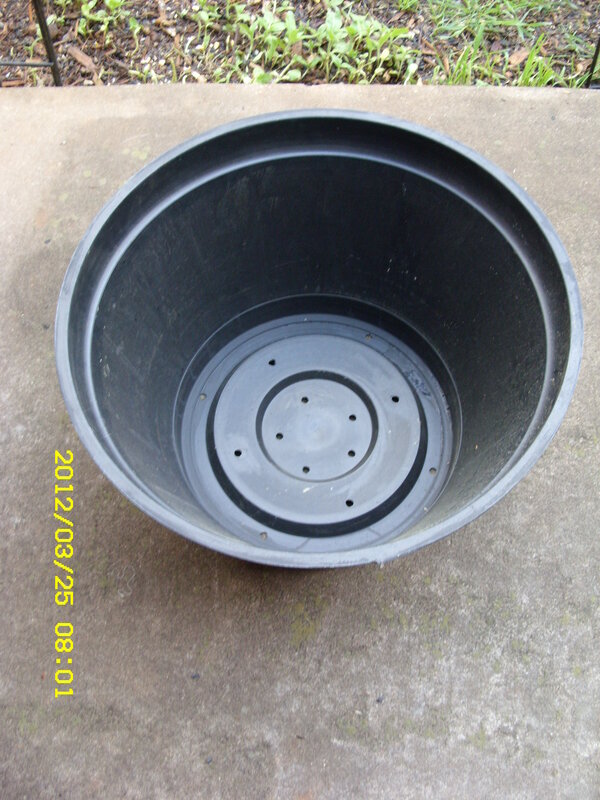 Planters are too expensive but I conceded to the purchase of a simulated half-barrel heavy-duty plastic from Lowe’s. 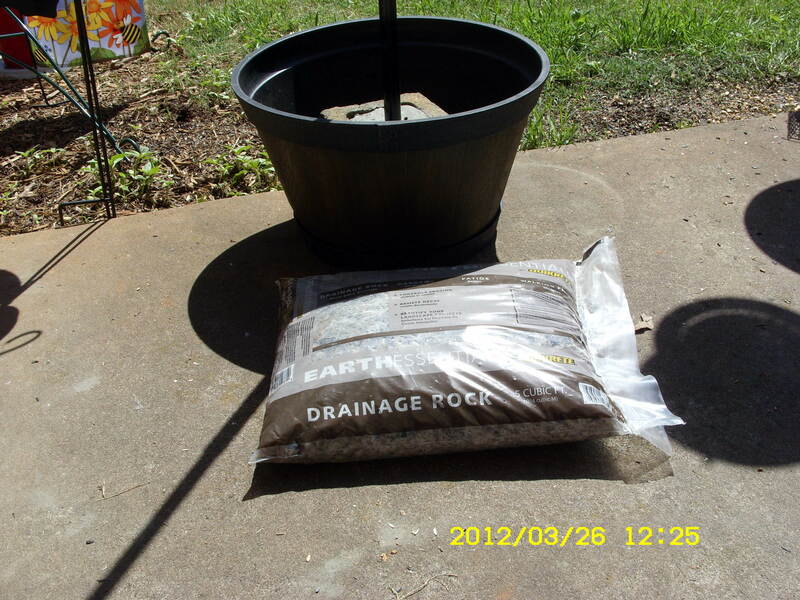 This was my fourth forty pound bag of cement!! 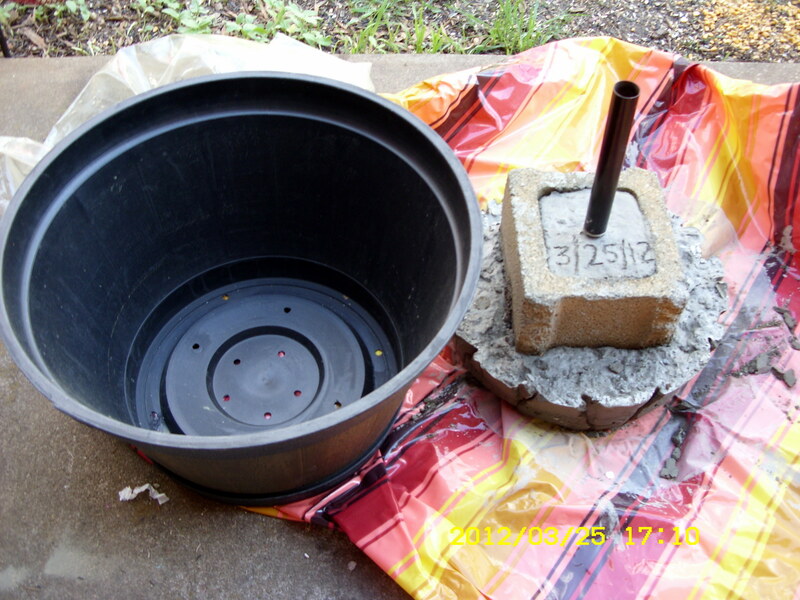 The center cement block came from discards in the woods. I still had pipe for the center support. 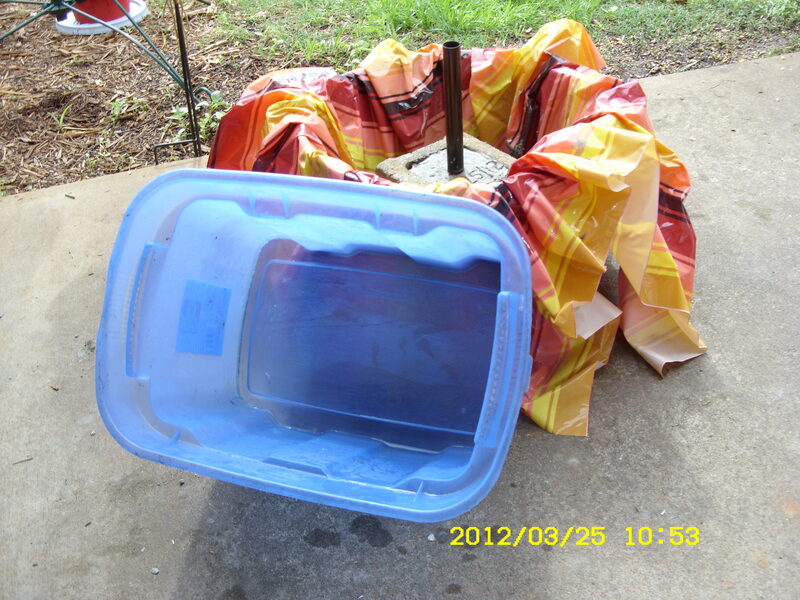 That’s an old shower curtain temporary liner. Confession: Instead of a $20. 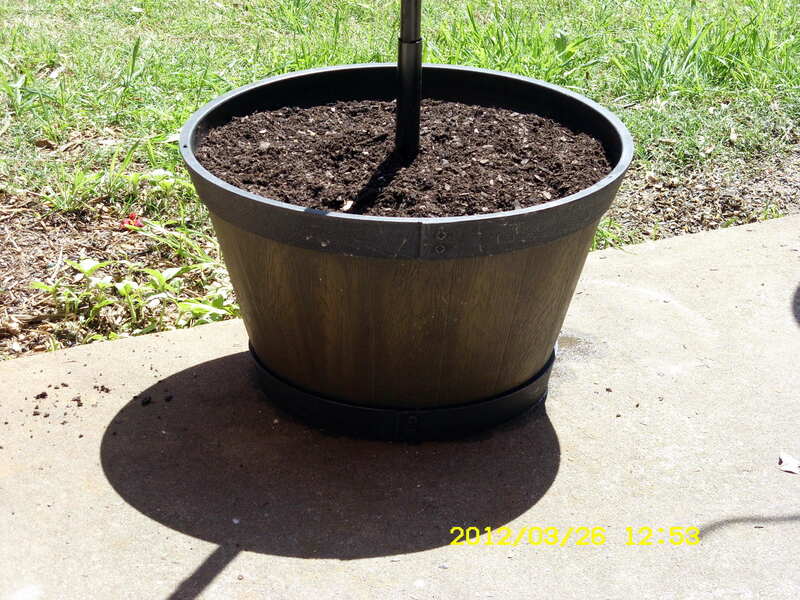 planter, I could have used a free five-gallon paint pail but I wanted something attractive just outside my patio doors. 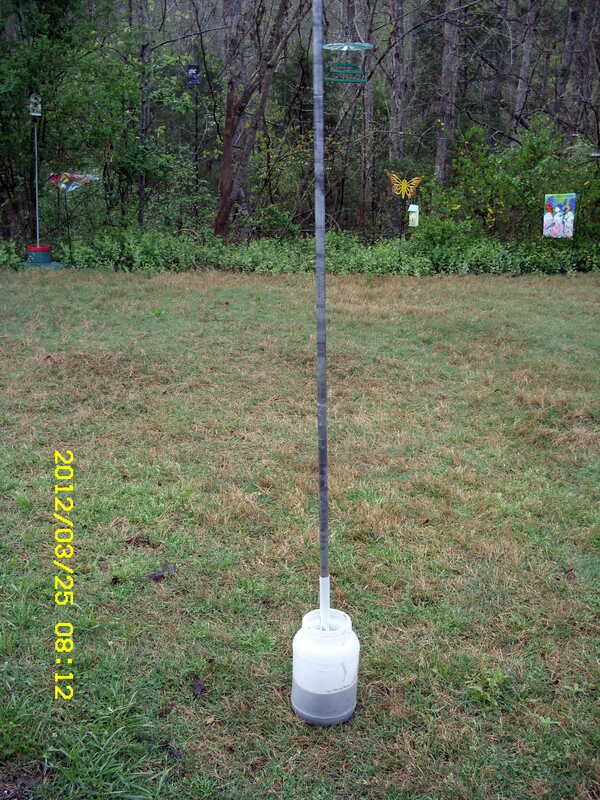 Quite frankly, I was adding too much weight for the Christmas tree stand!! 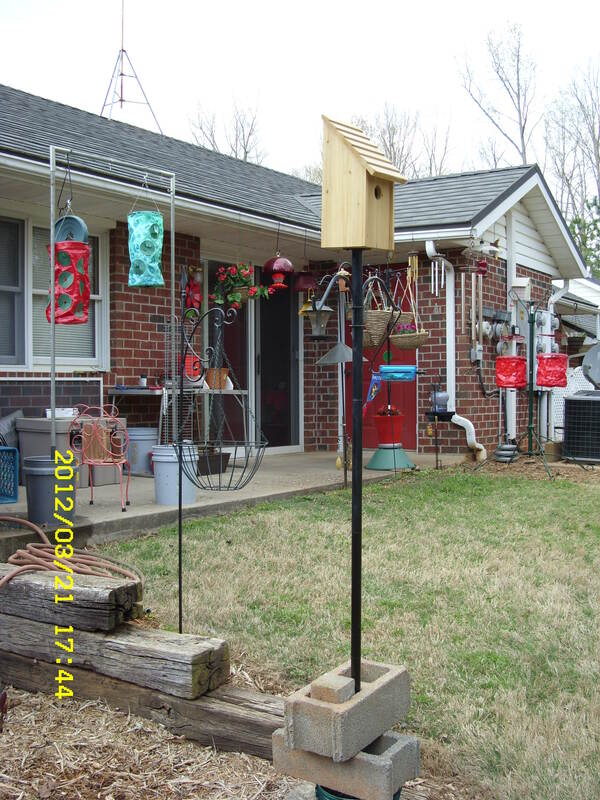 As of Friday, March 23rd, there were four hanging baskets full of soil and plants–and the rustic bird house on top. I suspected a disaster was waiting to happen!! I didn’t want to come home from work and find damaged plants, and soil, all over the patio. What if the pole and “topper” crashed against the patio doors and broke the glass?? (Later) Now I’ve accomplished the finishing touches. First: Removed the cement from the shower curtain lining. 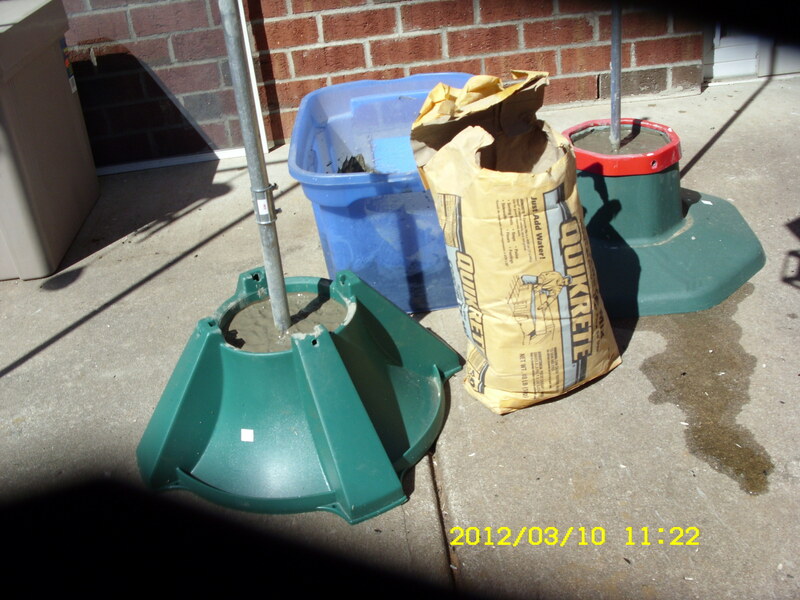 Situated the cement in the planter!! Voila!! Over 40-pound base!! 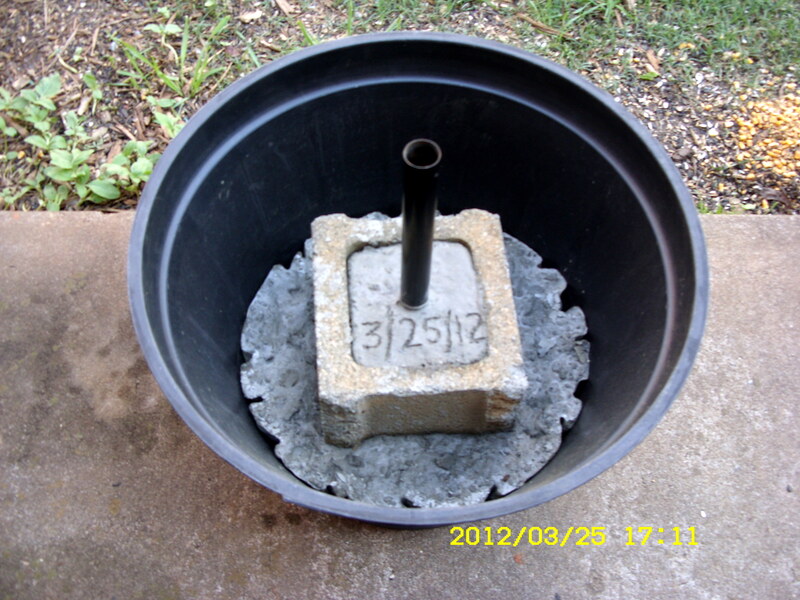 ~~ Second: River rock for drainage. 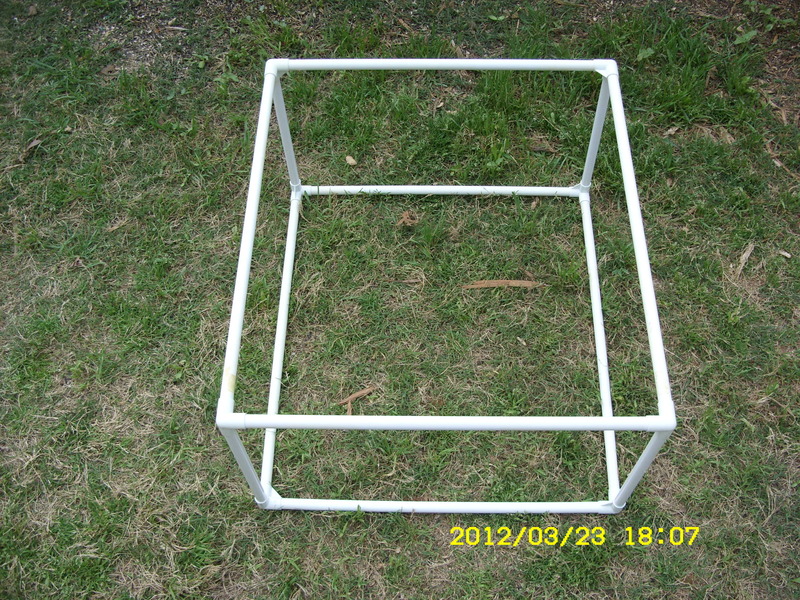 Package says half a cubic foot; weight not listed. I speculate at least thirty pounds. 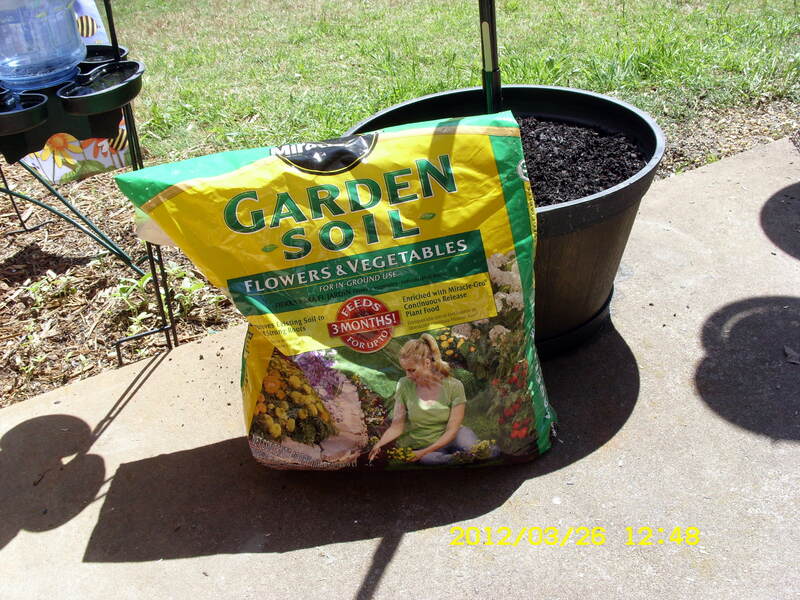 Third: Planter soil. 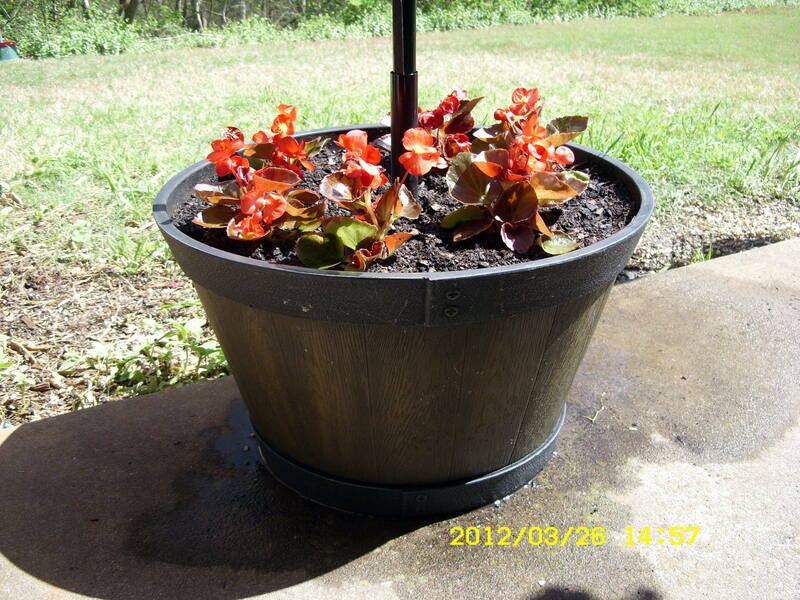 Fourth: Replanted the Begonias in the new planter. ~~ A masterpiece, in my humble opinion!! 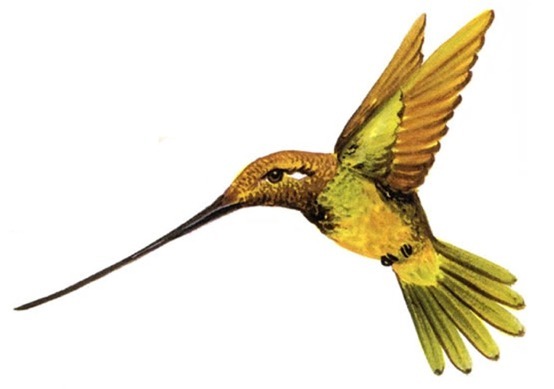 Not a Leonardo da Vinci or Michael Angelo; it’s “Lorraine at JAARS.” ~~ Hummingbirds welcome!! 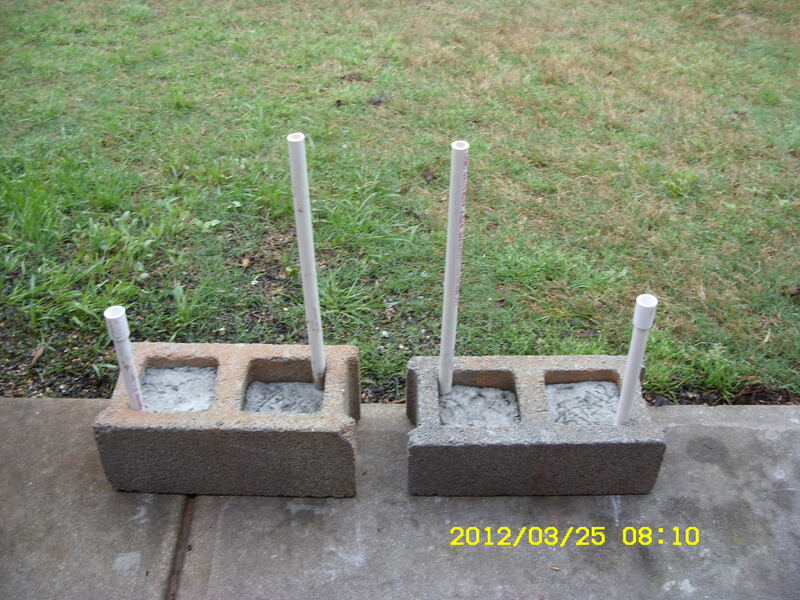 I spent Saturday, March 24th, mixing cement (again) creating weighted bases for trellis. I’m determined to use things I already own rather than buy new. 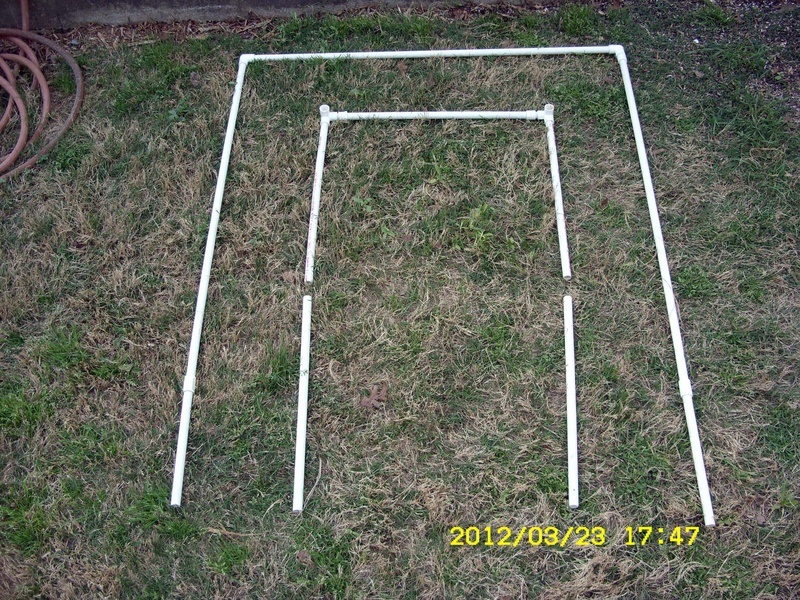 Have you checked the price of trellis lately?? 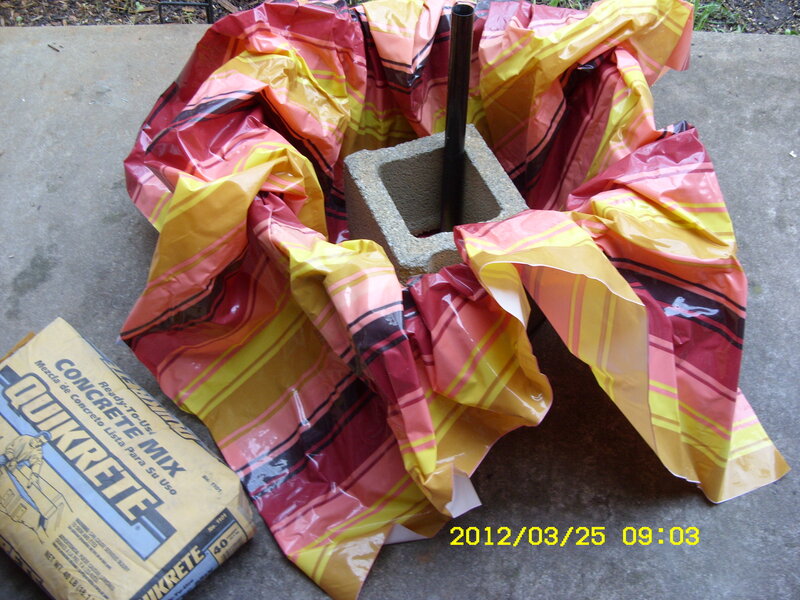 A 40-pound bag of cement is less than $3. ~~ I don’t have climbing plants yet but I’m getting ready. 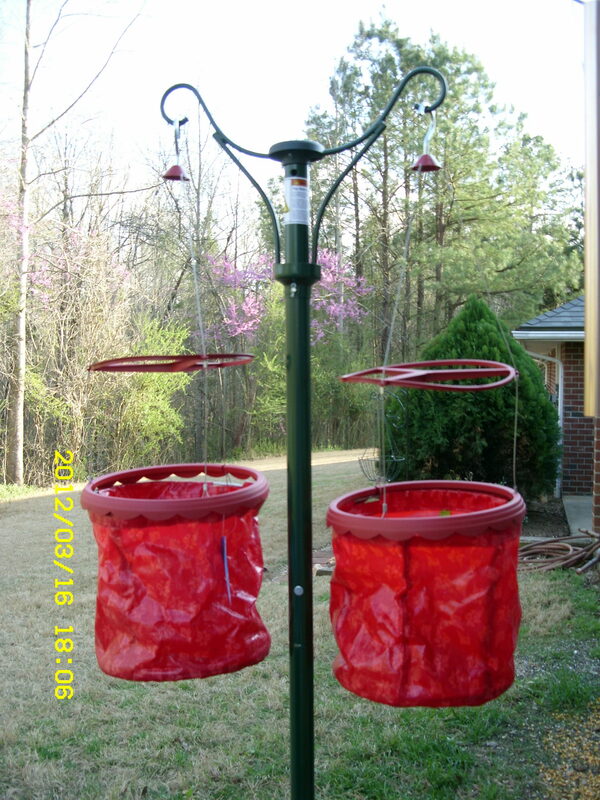 I’m planning to have lots of red-flowered plants to attract Hummingbirds!! 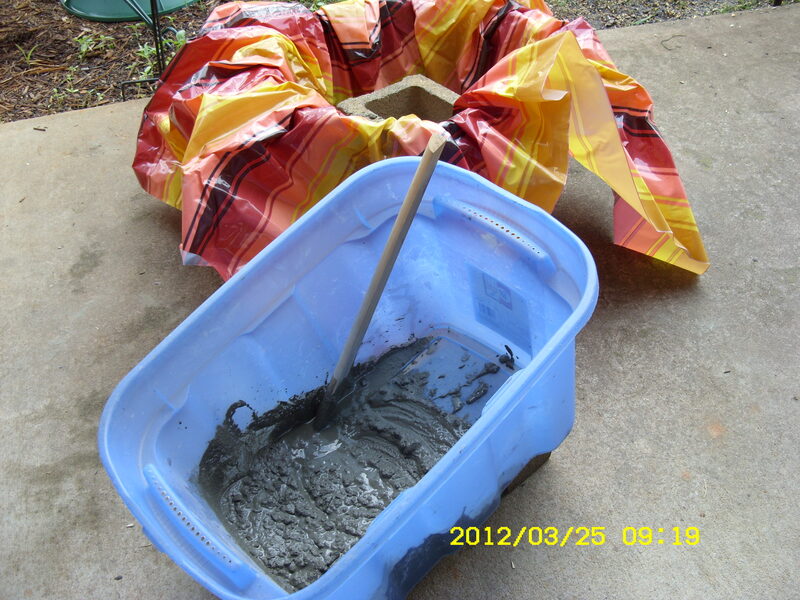 ~~ I spent this morning mixing cement for another project but I’m not ready to publish the pictures yet. Soon!! 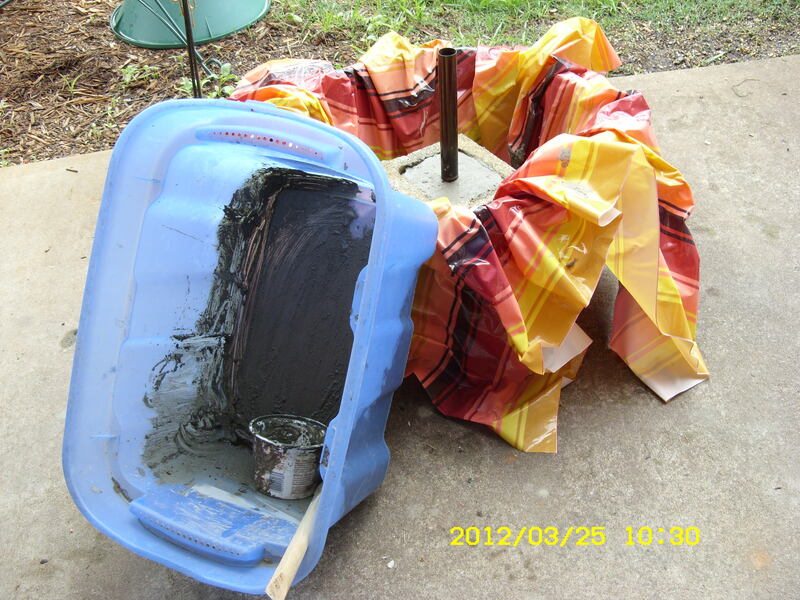 I never dreamed I’d have major problems when I decided to operate a wild life “bed and breakfast.” Below, in pictures, you can see some of my recent frustrations. 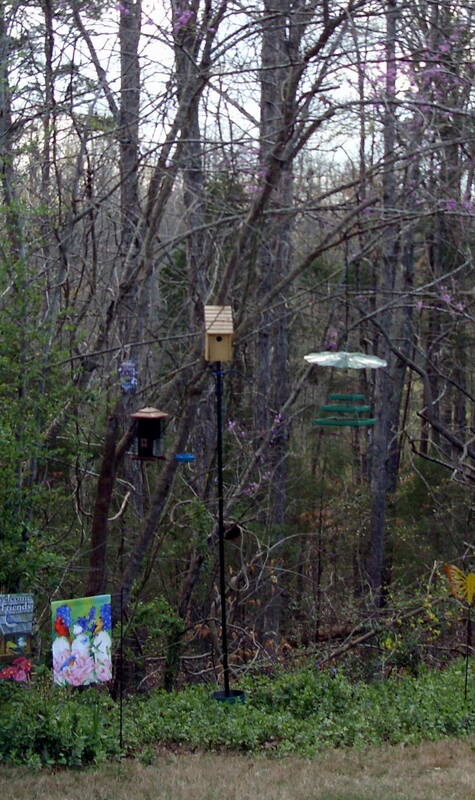 Two days ago, I awakened to see the Bluebird house leaning precariously. How could this happen after all my hard work (and the application of a Bungee cord)?? Oops, I forgot to take a picture. 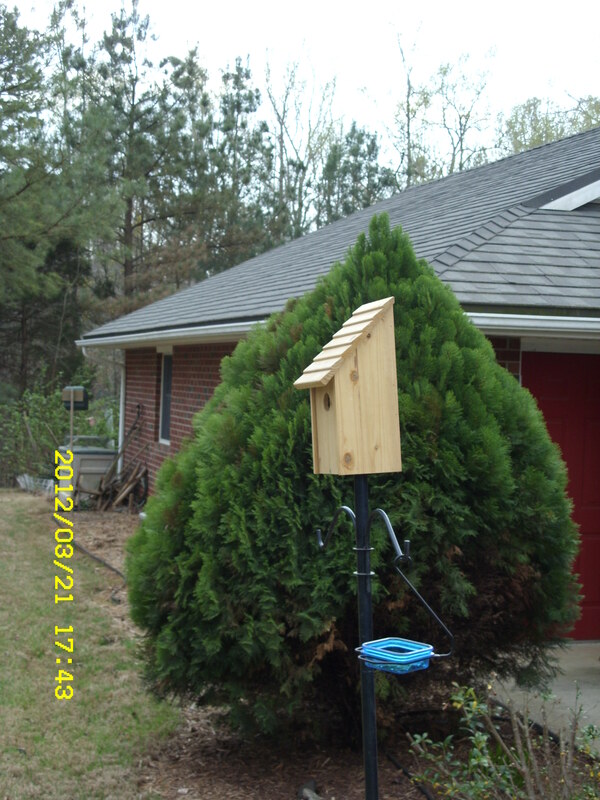 ~~ Now the Bluebird house is situated between my apartment and the neighbor’s apartment. I removed two sections of pipe so the house is closer to the ground and less likely to topple over. Note the extra weights at the bottom. 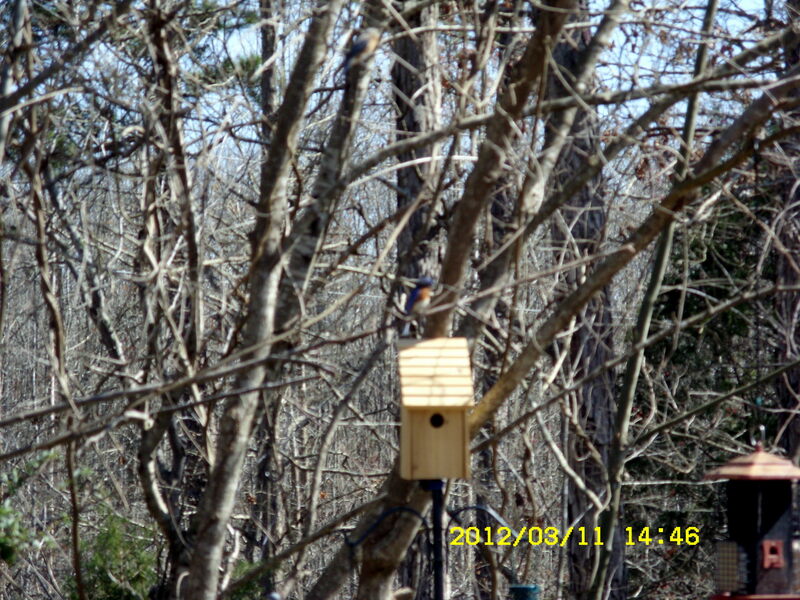 To add “insult to injury” (ha) some other species of bird adopted the Bluebird house. 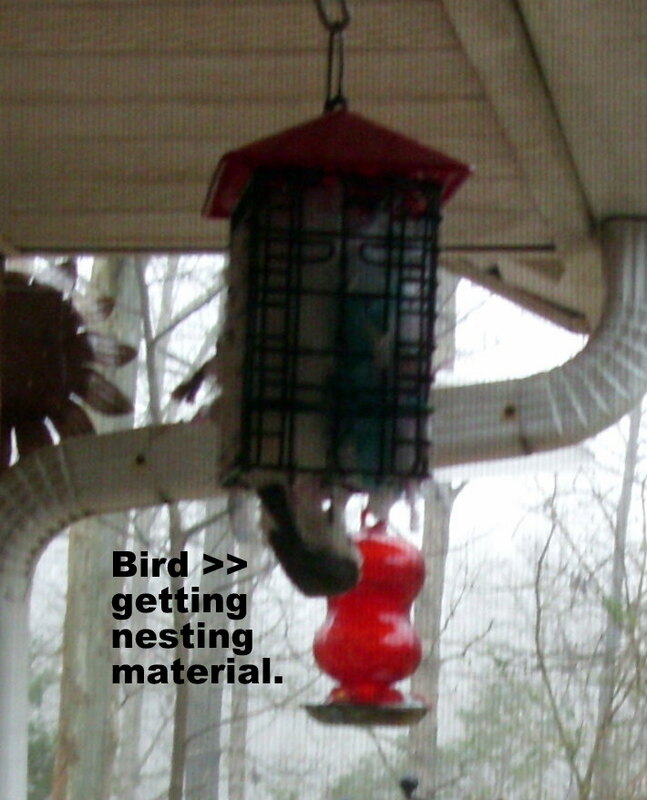 For several days, I brushed away the nesting material that accumulated. He/she was not intimidated!! 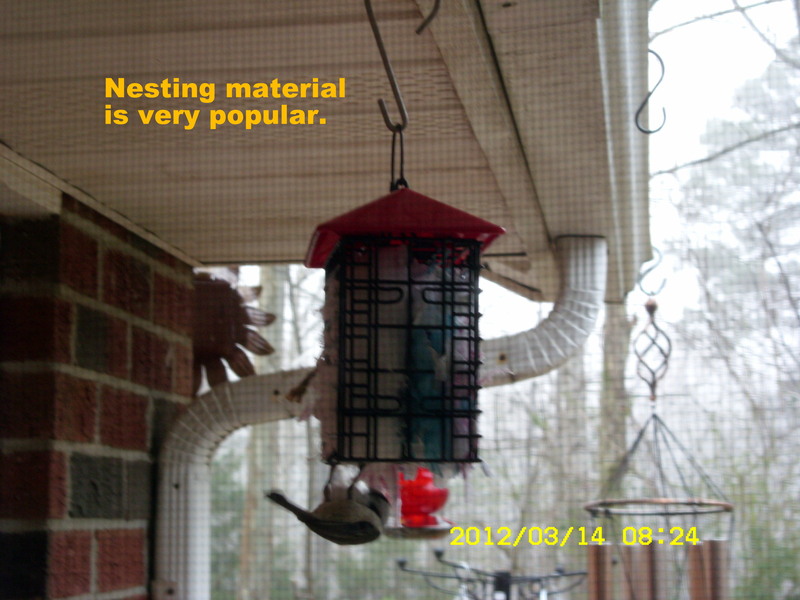 In one day’s time he/she put more nesting material in than the several previous days combined. I didn’t have the heart to evict them again!! 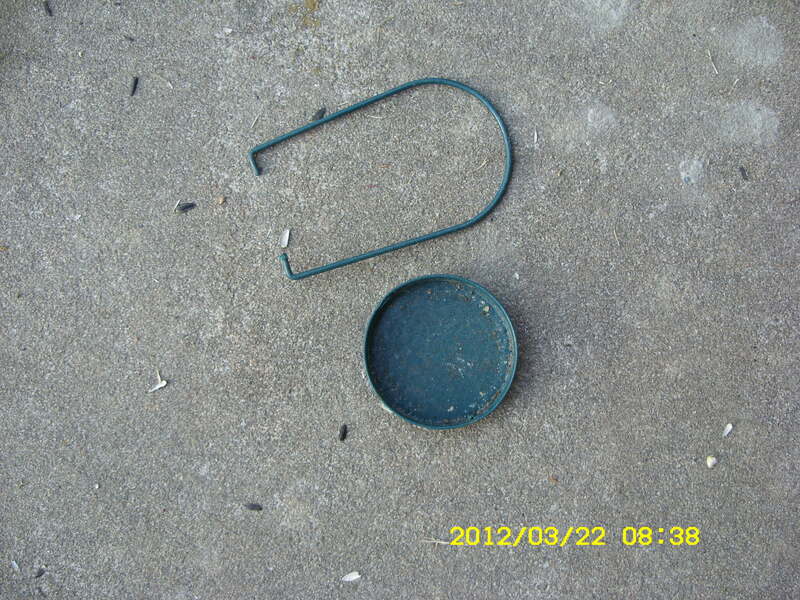 Yesterday I awakened to see that the bird seed and suet feeder had disappeared from its limb at the edge of the woods. 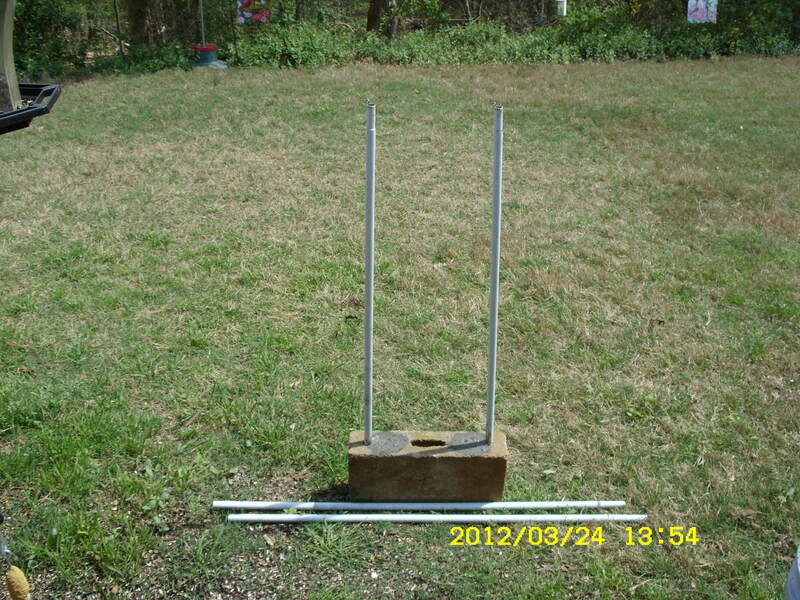 I had difficulty retrieving the feeder because there is a steep slope (not obvious in the picture). 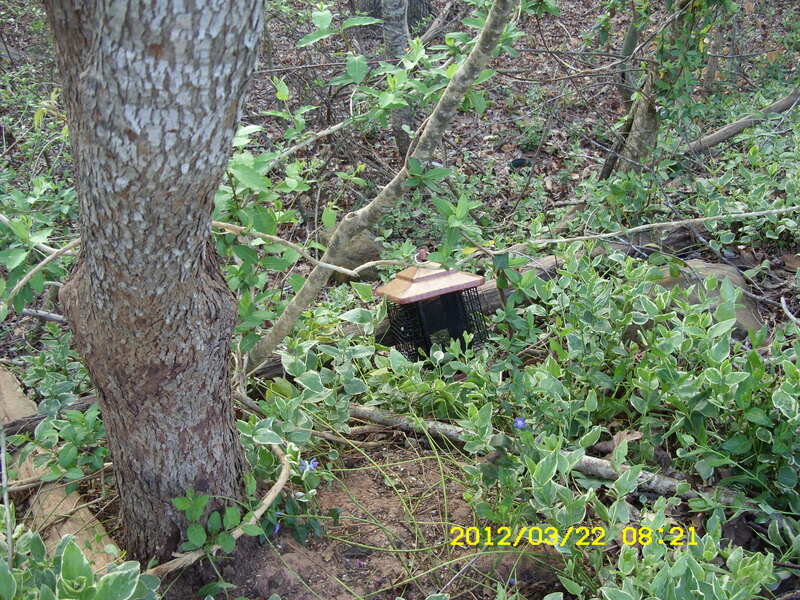 Fortunately, a fallen tree, or limb, prevented the feeder from cascading into an inaccessible area. 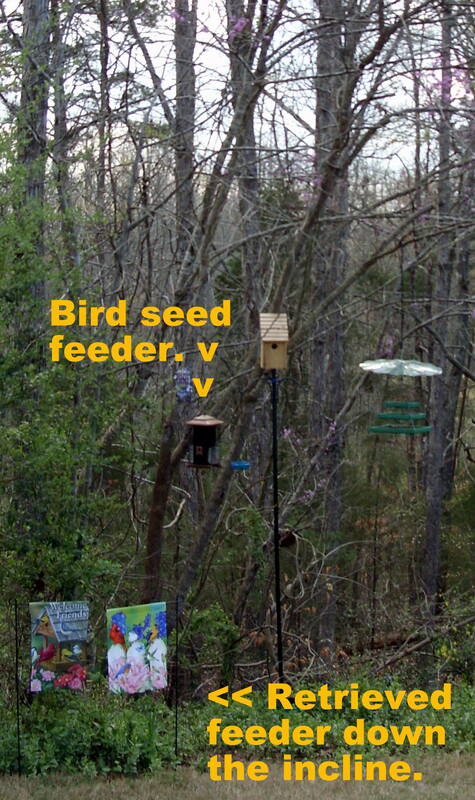 ~~ Two days earlier, a smaller feeder disappeared from that same area (and I can’t find it). Come sit a spell!! Enjoy the view!! (Click the picture to enlarge it. Click on the enlarged… and see even more detail.) Have a glass of iced tea?? ~~ Yes, there’s a lot to see from this vantage point. 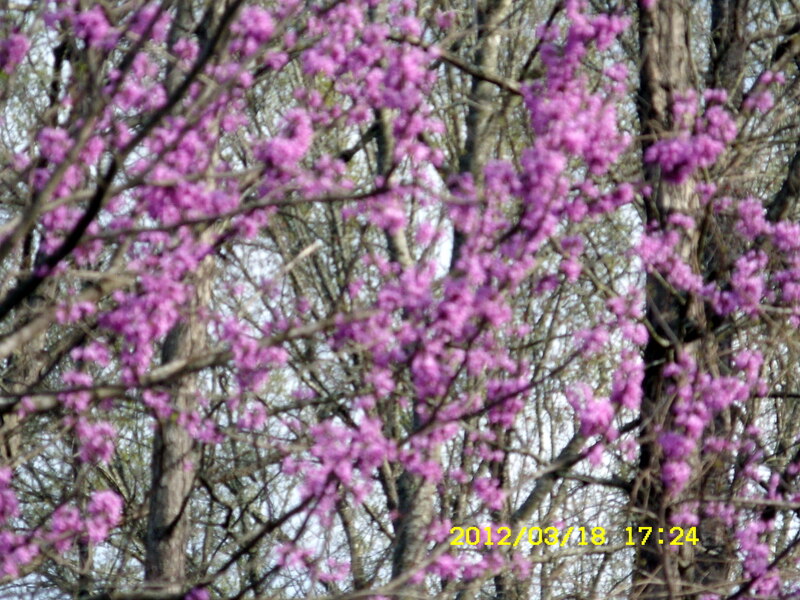 The camera is not capturing the beauty of the pink flowers blooming in the trees (so I’ve added a telephoto image). I’m hearing birds sing, and wind chimes ring. 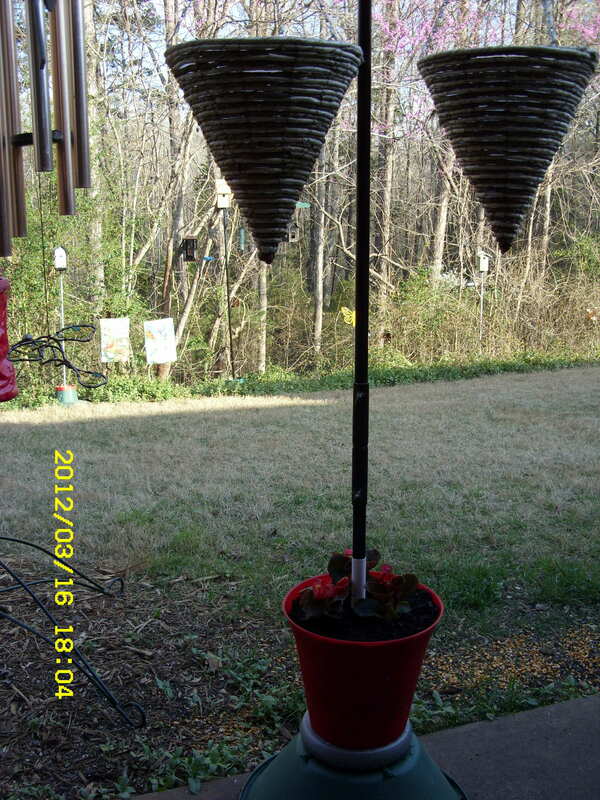 There is a red Cardinal in the black sunflower seed feeder near the Bluebird house. 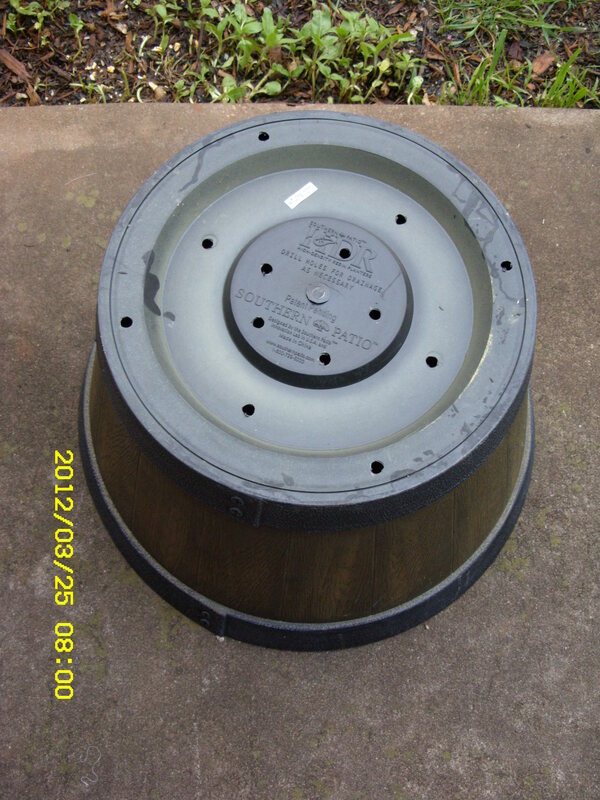 A bird is snagging nesting material from the container (top left of picture). 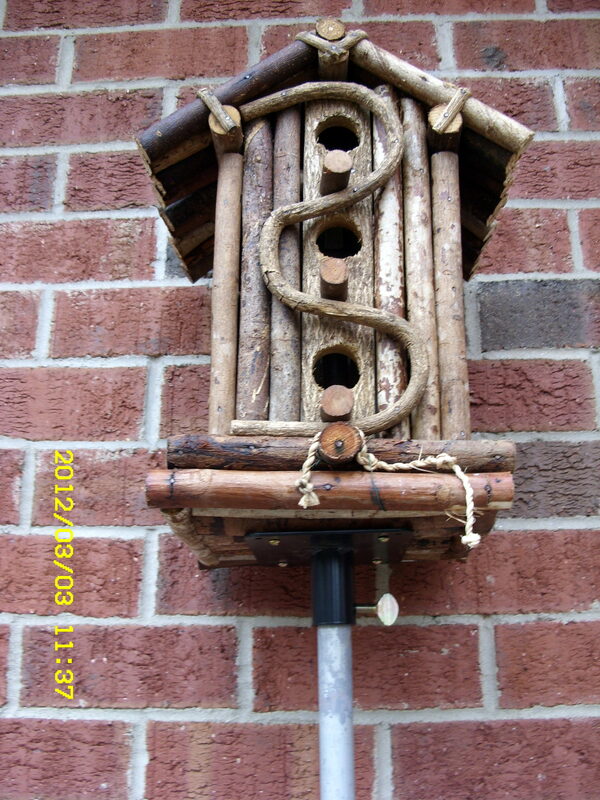 A Hummingbird feeder hangs from the eave and will receive nectar at my first glimpse of a Hummingbird!! 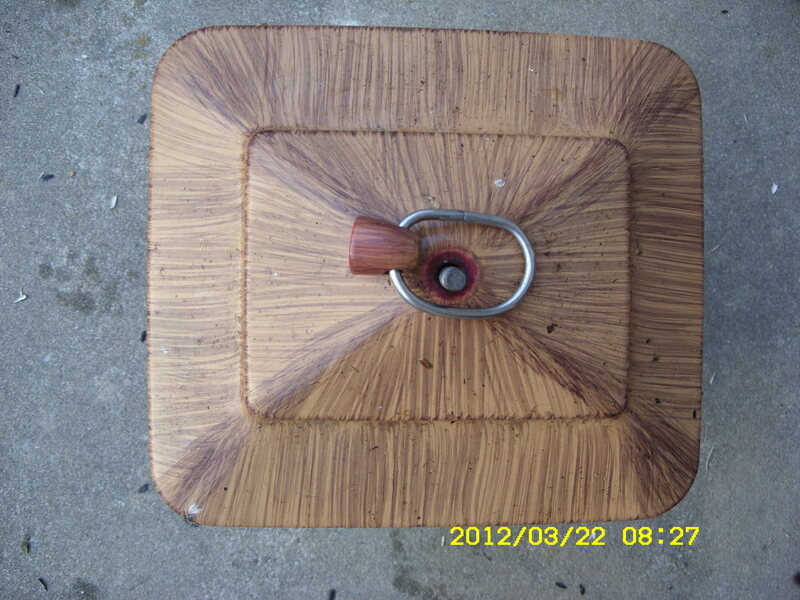 One Shepherd’s hook has been removed in favor of my homemade support for hanging baskets of flowers, and Begonias. Out of view, extreme left, are the Topsy-Turvy upside-down Hummingbird planters. Out of view, extreme right, is the support for the Topsy-Turvy upside-down tomato planters. 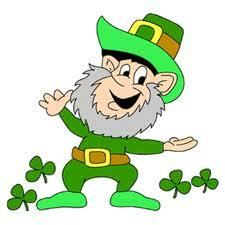 ~~ Happy Saint Patrick’s Day!! 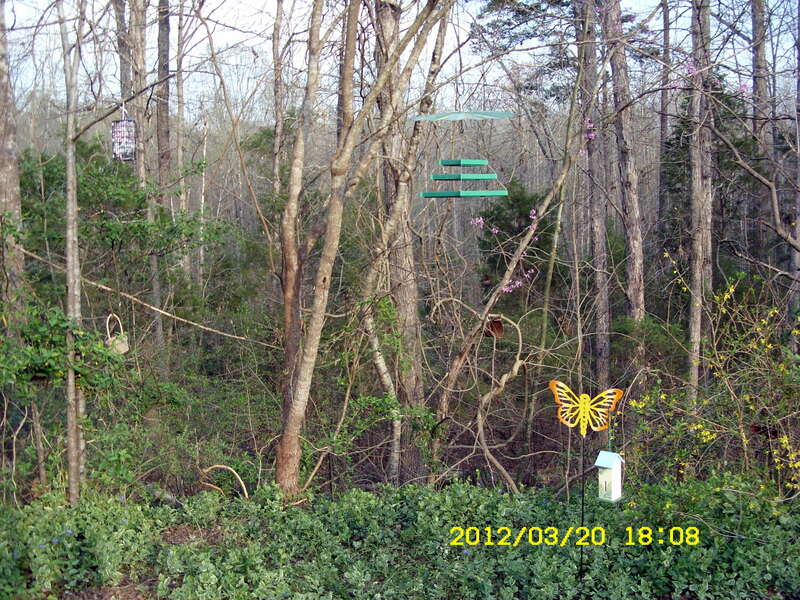 Postscript, Sunday, March 18, 2012, 9:00 AM: Last night, I checked an Internet site regarding Hummingbird migration. 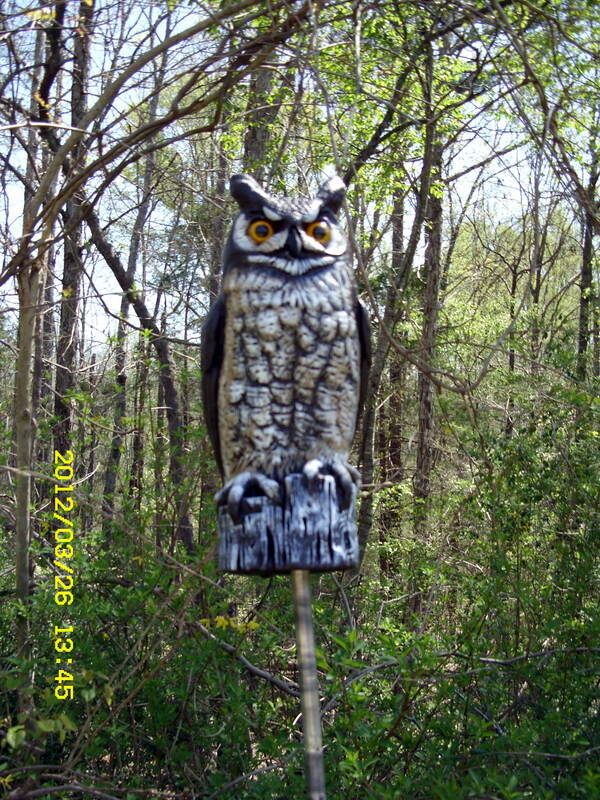 A sighting was reported in North Carolina on March 15th. 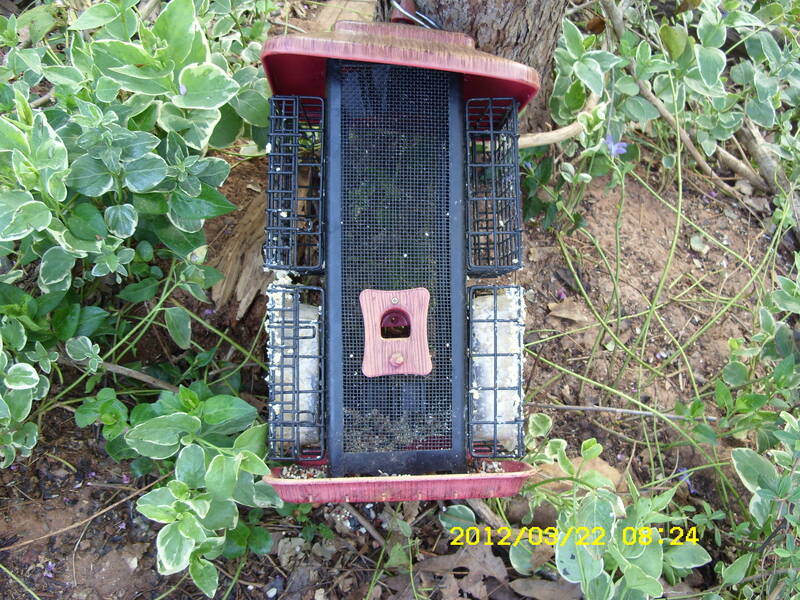 I prepared nectar (last night) and put it in the two feeders this morning. Postscript, Sunday, 6:45 PM: I searched the Internet this evening to learn the name of the beautiful trees. 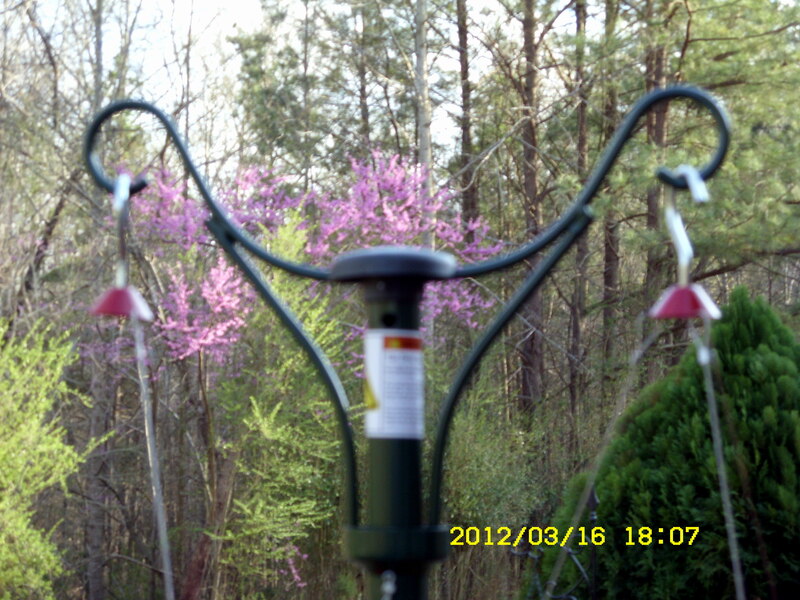 I’m convinced it is an Eastern Redbud (Cercis Canadensis). The link is only one of many sites that I visited. Backyard fanatic reporting in !! 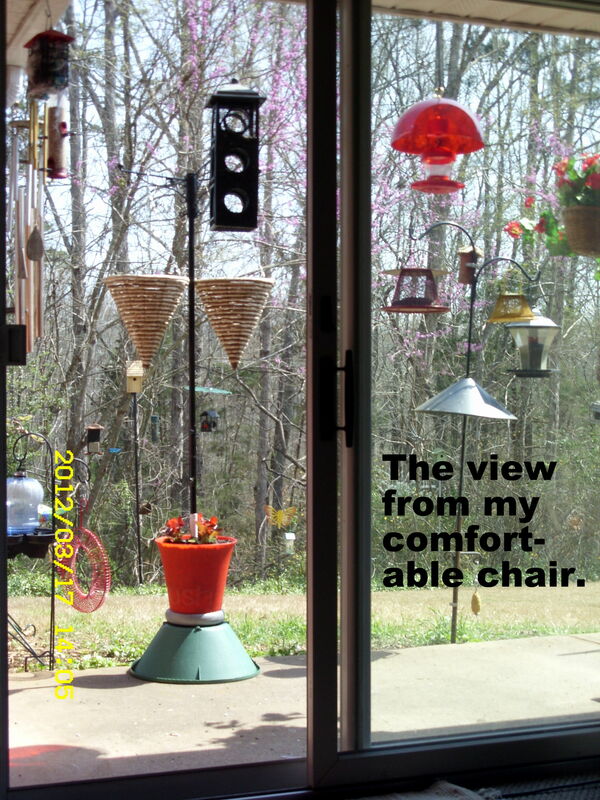 This week, I have a “one-track-mind” as I work to encourage Hummingbirds to my feeders. 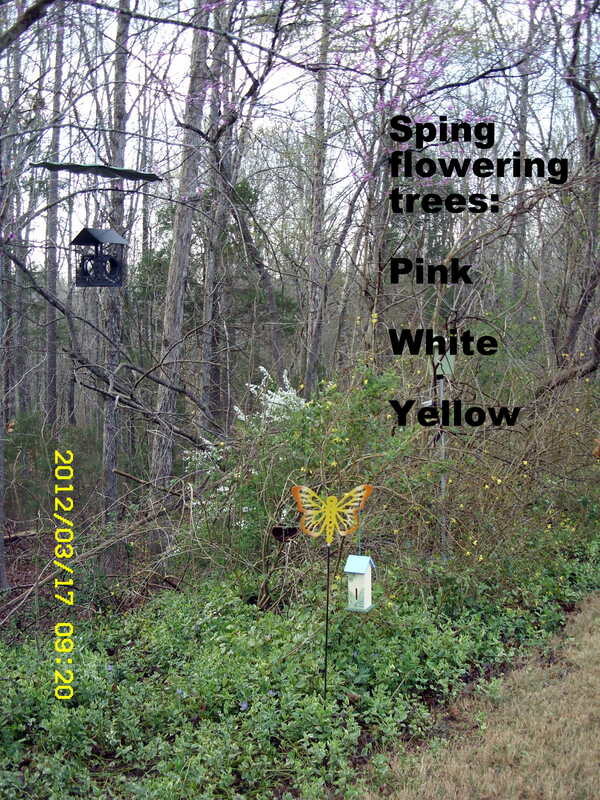 Still too early for the Hummingbirds but not too early to plan for bright color flowers. 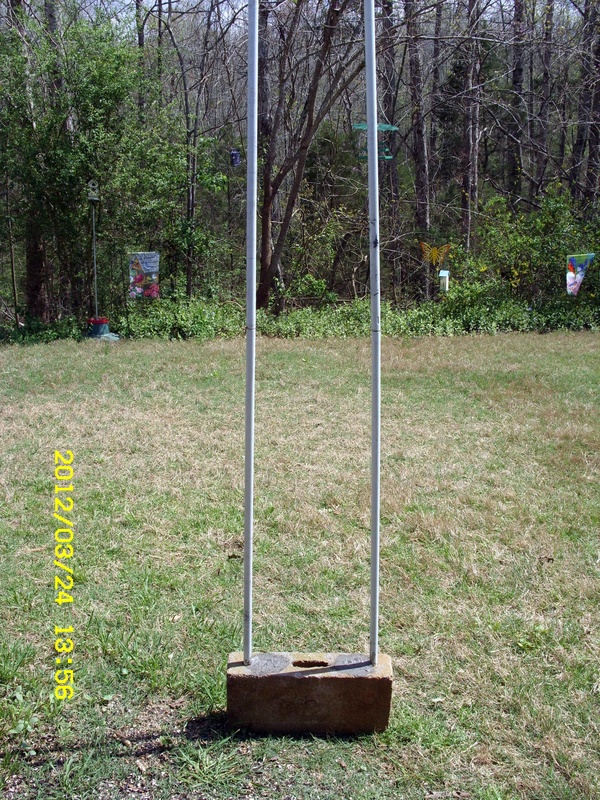 I bought two Topsy-Turvy upside-down Hummingbird planters (red, of course) and a hanging stand bearing the Topsy-Turvy brand. (Big Lots is promoting Topsy-Turvy products this week. 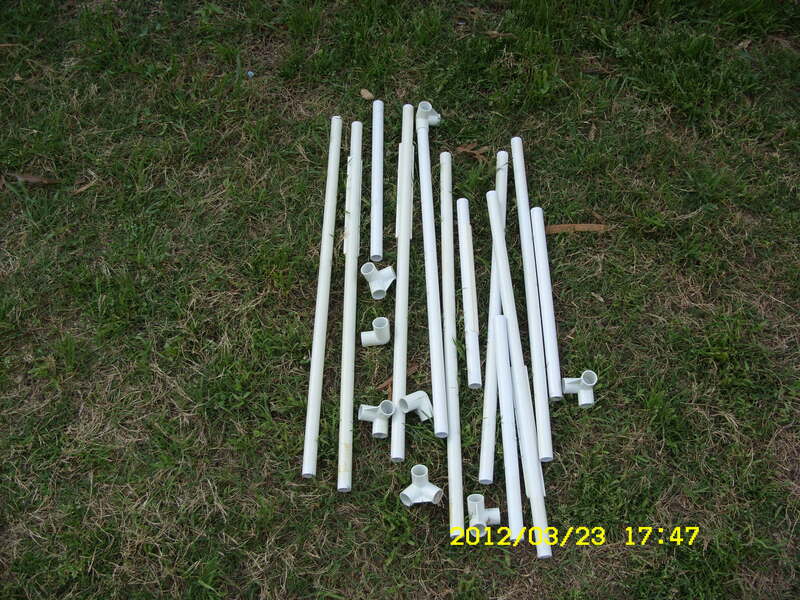 Had I known…[ha], I could have purchased very sturdy, very nice stands [for $10. each] and been spared all my earlier labor. C’est la vie!!) 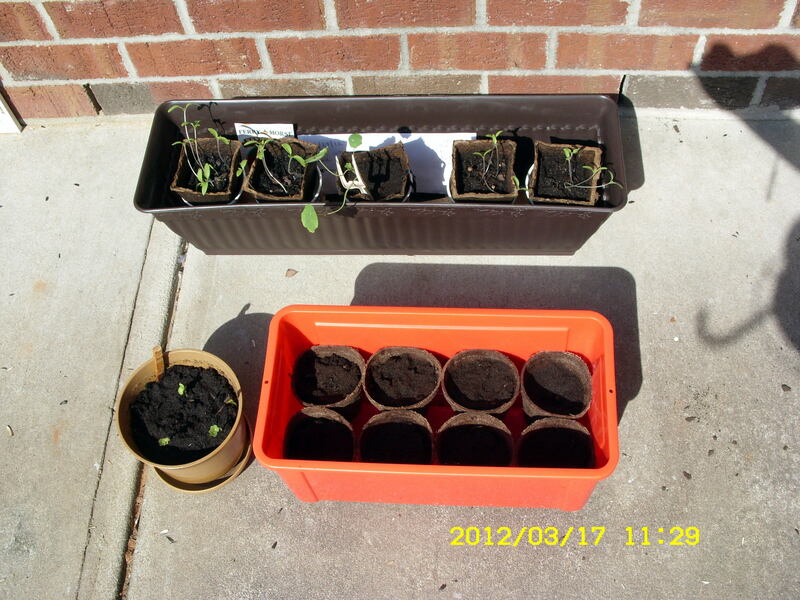 I’m organizing planters and planning the flowers that I will plant. (Lots of research on the Internet.) 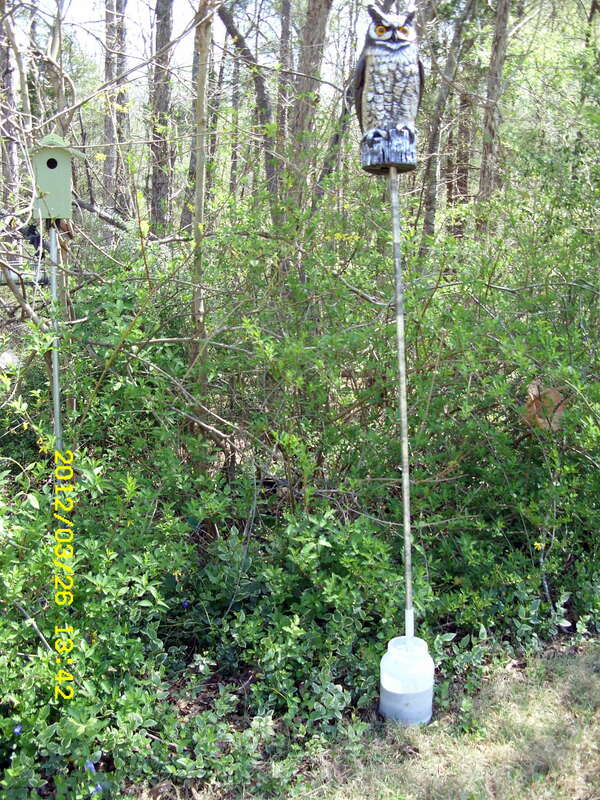 All with the objective to attract Hummingbirds!! ~~ We have a greenhouse here at JAARS that opened Thursday evening (for the first time this year). 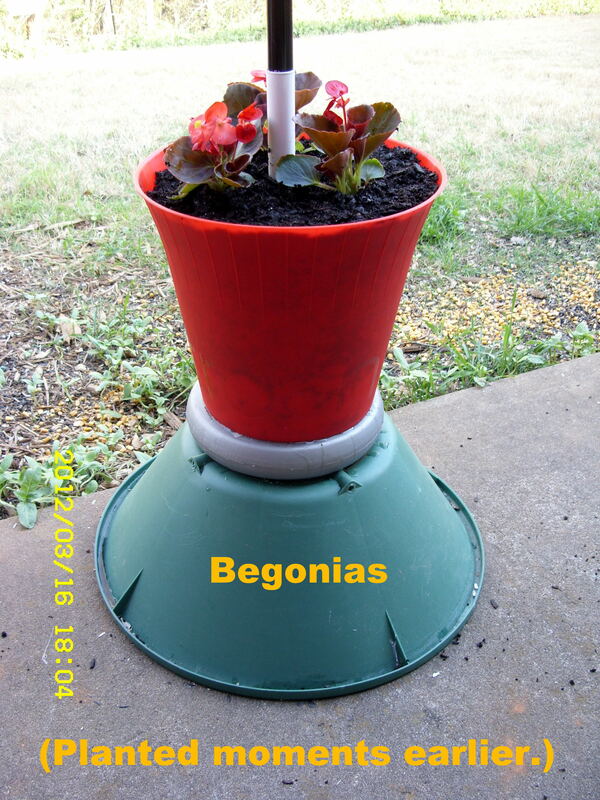 Last night, I purchased—and planted—Begonias in a red pot. 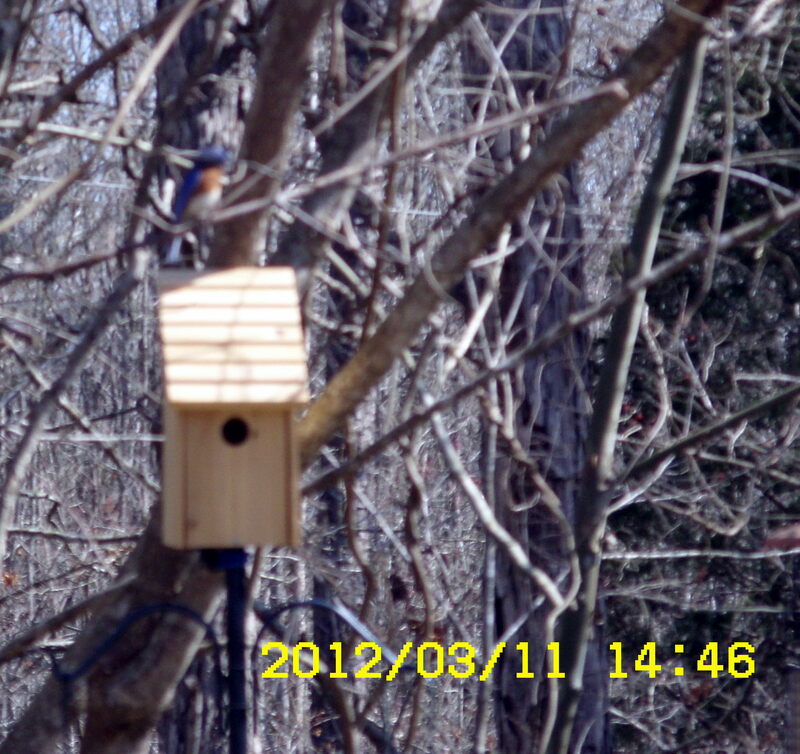 I’ve seen the Bluebirds a couple of times and hope they will adopt the bird house. 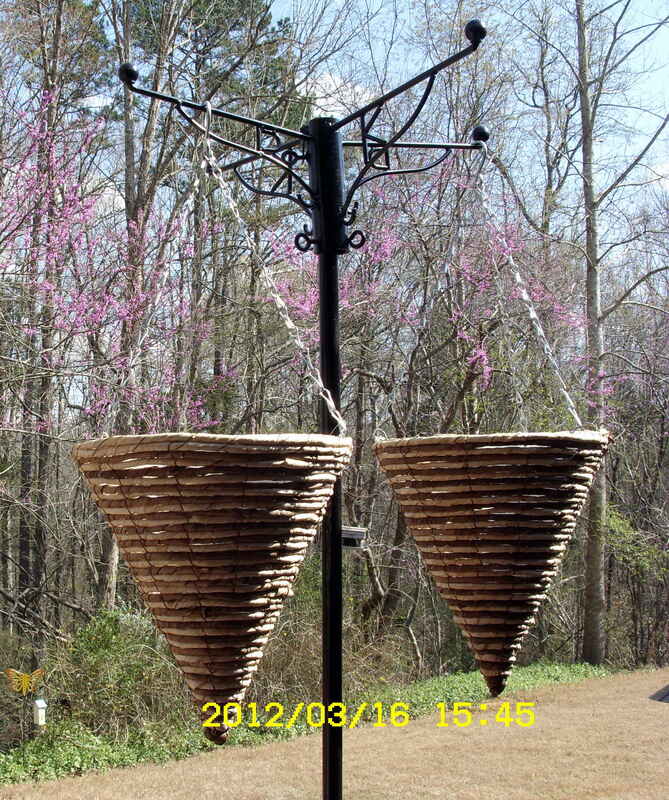 No interest yet (that I’m aware of) in other bird houses, and baskets, scattered at the perimeter of my yard. Some birds must already be creating nests because lots of visitors to the container with medicine-bottle cotton, string, and shredded cotton rags. I added dryer lint yesterday because I recently learned the birds love dryer lint. 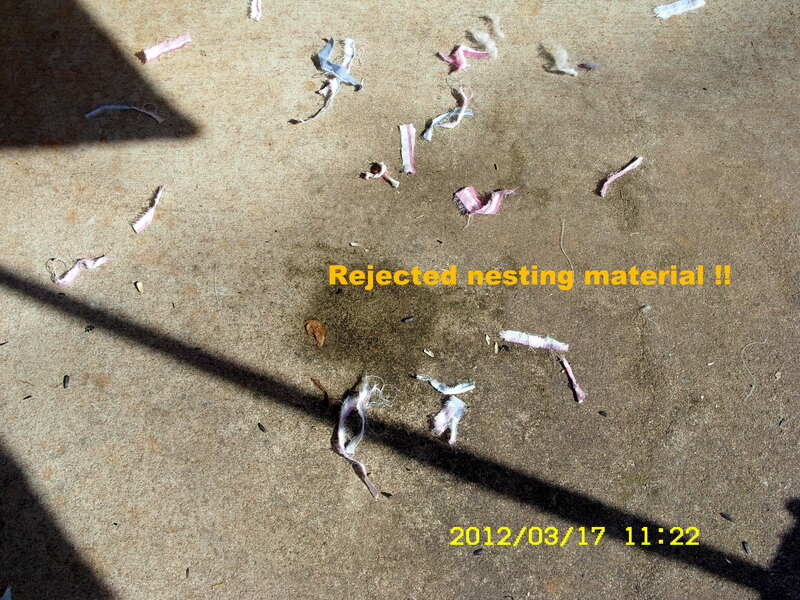 Postscript: At 11:20, I discovered some rejected nesting material on the patio. Perhaps I didn’t tear the fabric small enough?? Some of my plants are enjoying the beautiful morning. It should reach 83 degrees this afternoon!! We’ve had several beautiful days!! 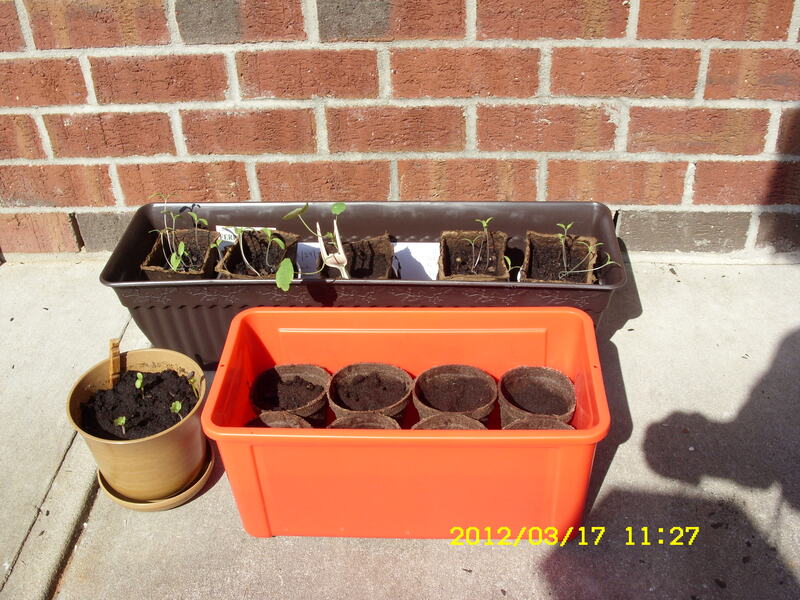 ~~ Tomato seeds growing in peat pots in brown planter. Nasturtium seeds in peat pots in red planter. Nasturtium in small brown pot. I think I’ll eventually plant Nasturtiums in the cone shape hanging baskets. What a thrill; I saw my first Bluebirds!! 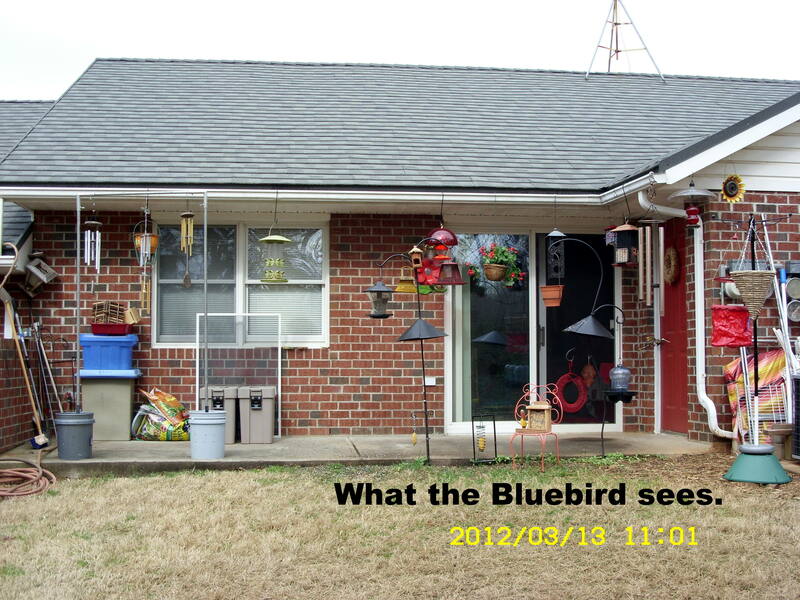 Maybe they have visited my yard previously but this was the first time I’ve ever seen a Bluebird. 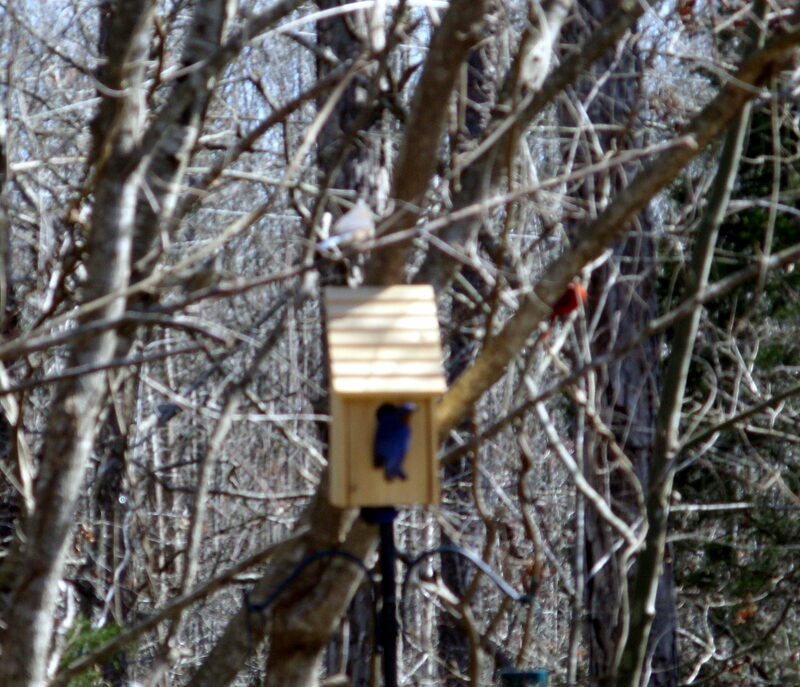 I saw three; it looked like “a pair and a spare.” They must be “house hunting” because they checked the Bluebird house that I have labored over for several weeks. My work was (is?) rewarded!! ~~ Click each picture to enlarge it for greater detail.